This is the term ethnologist Frank Cushing gave to Zuni processed seeds and grains. All kinds of batter cakes, bread and crackers were made by placing the batter in corn husks and covering with a scaffolding of stones for baking in the fire. Sweet mush is a kind of breadstuff, as are the delicate salt tortillas. The fire-baked crackers were known to be quite thin and flaky, in all the hues of corn: red, yellow and blue. Cushing reports that as the men filed in from work in the fields, the women would lay out a feast along the roof of steaming bowls of red chile stew and breadstuff crackers, inviting the workers to sit and eat. 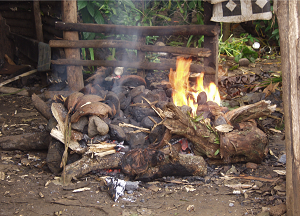 "An earth oven or Samoa umu" by CloudSurfer is licensed under CC BY. American Indian, Heye Foundation, accessed April 11, 2016.